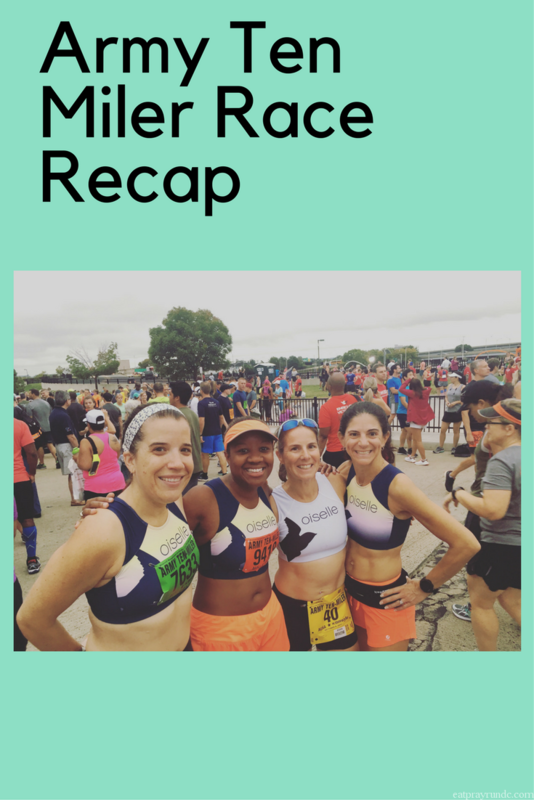 This year was my second year running the Army Ten Miler (recap from my first time is here). I am a military brat (my dad seven in the Air Force for over 22 years) and as such, I love all the military races. The ten mile distance is also my favorite to race, so I try and sign up for them whenever I can. This was just my second time running the Army Ten. I knew two weeks after Berlin that my legs might not want to go fast but I thought that if I could run marathon pace for the race that would be a good step towards possibly running another marathon next month. Race day was incredibly warm and humid. In fact, about 25 minutes after I finished, race officials turned it into a fun run because the weather was so bad and many were needing medical attention. I have run eight marathons and I have never seen so many people being carted away on stretchers as I did during this race. It was really crazy and I was think the race directors did the right thing. Anyway, on to the race. Like I said, I wanted to try to average marathon goal pace – so in the 9 minute mile range. With the weather, I kind of put that goal to the side and vowed to run by feel. I started the race with my friend and Oiselle teammate, Emily. We both said that given the weather we were not going to try and push it and wanted to run together because that is always more fun. This was my first time racing in a crop top and holy heck, I was glad I made that choice – the humidity was just overwhelmingly oppressive. It felt like a throwback to Berlin – but about 15 degrees warmer. UGH. Emily and I started out at a comfortably hard pace and tried to settle into a rhthym. We chatted and both reaffirmed that neither of us wanted to actually race the race – we were happy to just run. But when we reached the first water stop, I lost Emily, which sucked because that was only a couple of miles in. Boo but the race continued on. As you can see by my splits, I was getting incredibly hot and uncomfortable. This also was the miles that contained the 14th Street Bridge. And I HATE that bridge, haha. It’s long and hot and boring and just seems like it goes on forever! At this point, I was just ready to finish as soon as I could. I was hot and dripping sweat everywhere and it felt like I was swimming. I passed a mom and a little girl cheering and the little girl said, “mommy, why are they all so wet?” All I could do was laugh. I kept telling myself in the last mile, “your body will do what your mind tells it.” I’ve never used that mantra before but it worked to get me to pick it up a bit in the final mile. 1:31:06 official time – not a PR of course, I was not racing. I was really proud of myself for pulling out that time in such terrible conditions. I was VERY happy when I crossed that finish line! I can commiserate with this experience, but on a different level. I’ve run the ATM three times, but 2005 was the most memorable. That was the year I was suffering most in the last few miles, wondering where the water stations were and why they changed the course. Coming through to the end, runners who had already finished congratulated us on finishing the “first-ever Army 11 1/2 miler”! Turns out the 14th St Bridge was blocked off due to a suspicious package and the lead runner had no choice but to improvise back to the Pentagon. Definitely an unforgettable race. I’ve read a few recaps of this race and it sounds as if finishing was winning! You had a great finish time, especially considering the conditions! Congrats, Courtney! I like your motto for the time “your body will do what your mind tells it”. So when you say they turned it into a fun run, do you mean they stopped the clock? They rerouted people to cut off a mile of the course after a certain point. Congratulations on your race Courtney- it took a lot of guts just to get out there and run such a long distance so soon after Berlin. Even if you didn’t hit the goals you wanted or PR, you still ran the race and you finished safely and injury-free. The weather here was absolutely brutal that weekend too and I don’t think anyone’s race times reflected their training. I was confused about them turning it into a “recreational run”. Unless you’re an elite, aren’t they all timed fun runs, you know? But it’s certainly scary to see people being carted off on stretchers during a run. Thanks – I did actually hit the goal I had set – which was to run marathon pace miles. So that was a total win – especially with the weather. I did NOT set out to PR and I don’t think I would have been able to even if I had tried with that weather, lol. Yeah the fun run thing was weird but my guess is that it had a lot to do with liability. Way to gut it out during awful weather conditions. Congrats! Too funny! I thought you looked so familiar at the start line. I ran “incognito” this year (no singlet) and was right next to you and the group of birds in wave 3. Conditions this year were insane. Congratulations on your run! Great job! That weekend was also brutally humid here in Pgh–the worst it’s been all summer–and I cannot imagine racing in that–and being on point for so many of your splits! Congrats! Jennifer @ Dashing in Style recently posted…Marathon Training Week 12: Survived 50 MPW! Oh that little girl’s comment has me laughing. The weather for this year’s ATM sounds just as miserable it it was back in September for my 20 miler. Cutting the race short to focus on providing medical attention to those who were overheated sounds like the right decision. Oh, I like your new mantra, “your body will do what your mind tells it.” That’s soooo true! I was supposed to run the Army Ten-Miler for the first time ever, but changes in a spot on the skin just above my knee had other plans. My doctor and I agreed that with my history, it was best to get it removed before things turned ugly and as a result, I couldn’t run for two weeks. Maybe next year? You did quite well given the weather!! I ran the Columbus (OH) half marathon on Sunday at it was warm and humid too. I was hoping to keep a 9:00 overall pace, but ended up with 9:30. Oh well! I was shocked at how some people were wearing the race shirt (long sleeve tech) or something similar. I would have died of suffocation if I had more than a skimpy tank top on. Love the crop top you have! It sounds very comfortable. Oh man, I heard that the weather for that run was absolutely miserable! I’m not sure why the humidity has been SO bad this month but it really needs to go away..
Great job! I’ve heard everyone say this was a super tough race and a hard one to push through on. That’s scary that so many people needed help from medical. I’d say you did fantastic at your goal of keeping at MP!! LOL on that girl’s comment! #truth I will keep your mantra in mind in Bethlehem this weekend. Yes – have fun! I can’t wait to read all about it!